The Armstrong Basin in the Gulf of Mexico, named for Joint Hydrographic Center NOAA co-director Andy Armstrong, is about 100 miles south of Galveston, Texas. Armstrong, who is assigned to the JHC as a civilian NOAA employee, is very much alive. In 1992, he was captain and chief hydrographer of the NOAA hydrographic ship Whiting when it mapped the seafloor bathymetry of the northwestern Gulf of Mexico that included his now eponymous basin. 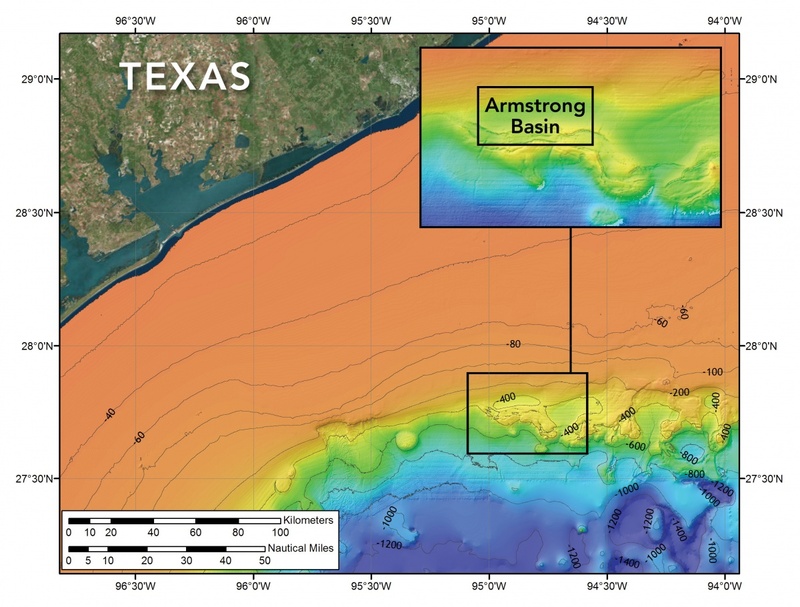 Compiling a more detailed seafloor map of the area recently, a team of oceanographers from Texas A&M University proposed that the basin, located just beyond the edge of the continental shelf about 180 kilometers (just over 100 miles) south of Galveston, Texas, be named after Armstrong. "While Andy's basin may be a large depression, his presence at CCOM/JHC has been anything but." The Armstrong Basin is a depression in the seafloor 10 by 30 kilometers in area and ranging in depth from 325 to 450 meters. While Armstrong recalls the seafloor of that area being interesting — “irregular with a number of bumps and basins” — he doesn’t have a particular memory of mapping “his” basin. That’s in part because unlike today’s mapping technology, hydrographers couldn’t “see” the seafloor in real time on ship-board computer screens. “You got a bunch of numbers back, then after the fact you could print up contour sheets,” he says. “It was different than the systems we have now, where you can perceive the sea floor as you go.” Researchers at UNH’s Center for Coastal and Ocean Mapping and the Joint Hydrographic Center Armstrong co-directs are at the forefront of the technology that brings bathymetric data to life with visualization. Pleased to have a basin named after him, Armstrong notes that the Armstrong Basin is an honorary, not ownership, designation; any royalties from any resources would go to the federal government. “It’s probably sitting on top of oil,” he says.